For connecting a remote DUT to a JTAG controller without signal integrity issues. LVDS, up to 10 m distance. Galvanic isolation protection between a DUT and a JTAG controller. Can be easily mounted inside a test fixture. Intel® XDP header, low impedence. 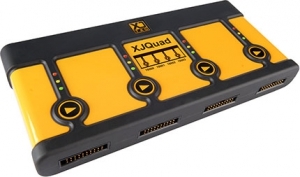 Provides signal matching to improve JTAG performance. Supports non-XDP applications. 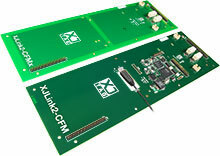 Allows the XJLink2-3070 to be powered, used and tested outside of a Keysight (Agilent) 3070 ICT machine. 20-way 0.1” connectors in and out. Terminal to central ‘test’ GND point. Pads for termination / ESD protection. 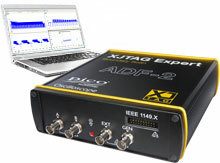 Allows oscilloscope or test meter access to the signals used when connecting the XJLink2 JTAG Controller to a DUT. 20-way 0.1” into two 20-way 0.1” connectors. Improves signal integrity by putting a ‘hard ground’ between each active signal. 20-way 0.1” into two 20-way 0.1” connectors. ‘Hard grounds’ between active signals. Small Form Factor. Fits XJQuad. 20-way 0.1” connector to a standard Xilinx 14-way 2 mm connector. 20-way 0.1” connector to a 20-way 2 mm connector. 20-way 0.1” connector into two 10-way 2 mm connectors. 20-way 0.1” connector into two 10-way 0.1” connectors.